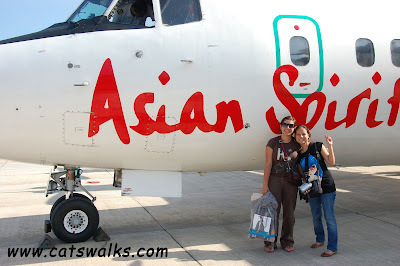 There was a deafening silence as the passengers of Asian Spirit bound for Coron boarded the plane. I guess we are all asking ourselves the same question and yet too afraid to voice it out loud "Can this thing actually fly?". The interiors of the plane looked very badly maintained, the windows were browning on the sides, the aircon was off, the seat upholstery was old, and paint was chipping off. It felt like the plane had not been maintained for 20 years. All I was praying for then was that they maintained the engines better. The propellers started to move (someone literally jump-started it by hand) and the plane started to take off. There was silence in the cabin. The plane started to fly. Suddenly, I remembered a joke someone told me a few years ago "Fly Asian, land in spirit." I refrained from telling my husband and Marido (our Italian friend) this joke during the flight because I noticed that they were also very silent. There was still silence amongst the passengers, as if they were afraid that the sound of their voice would cause the plane to have problems. The next thing I hoped for was that the plane could land. Then finally Coron! The plane lands on YKL airport (more like an airstrip) surprisingly smoothly. As soon as we landed the other 2o+ passengers started to chatter. Yes, we made it! Welcome to Coron! I didn't mind the flight at all anymore during the return flight. I guess it was the shock of seeing the plane for the first time. But knowing that the plane could actually fly and land made the return flight quite pleasant. I've been on some planes before that make you wonder if you are going to land.